Publics in advanced and emerging economies alike generally agree that growing trade and business ties with other nations are good for their country, at least in theory. But far fewer are convinced that increased trade results in more jobs, higher wages or lower prices at home – all benefits frequently touted by economists and proponents of international trade. 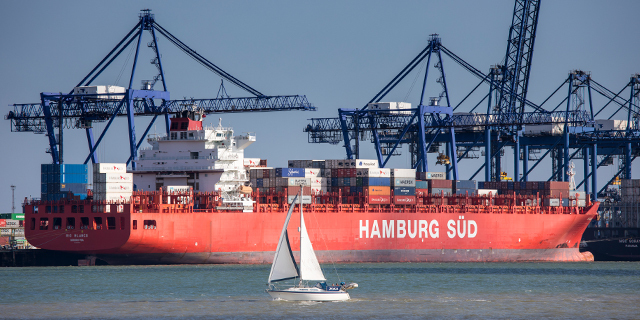 Americans and publics in advanced economies are especially skeptical of trade’s role in boosting wages – only about three-in-ten in the United States and across the other advanced economies surveyed subscribe to this view. Slightly more Americans think trade lowers prices and generates new jobs (37% and 36%, respectively). Among the other advanced economies polled, a median of 47% link trade to job creation, while 28% say prices decrease thanks to trade. People in emerging markets are even more dubious of trade’s impact on prices – a median of just 18% in these countries say it drives prices lower. 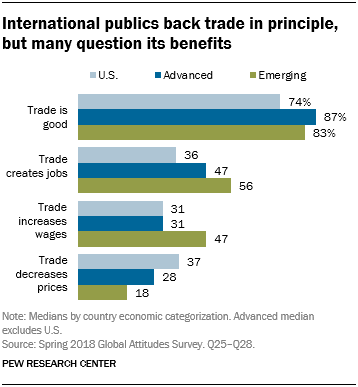 But publics across the nine emerging markets surveyed are enthusiastic about trade’s other economic benefits: A median of 56% think trade leads to more jobs and 47% say it improves wages. These are among the key findings from a Pew Research Center survey conducted among 30,133 respondents in 27 countries from May 14 to Aug. 12, 2018. The nations included in the survey account for roughly two-thirds of the global gross domestic product. In many of the 22 nations polled in both 2014 and 2018, public views of trade’s impact on jobs and wages have not changed substantially. But there are exceptions. In the U.S., the share of adults who believe trade creates jobs has risen 16 percentage points over the past four years. In Poland, it has increased 10 points. Conversely, faith that trade generates employment has fallen 26 points in Argentina and 20 points in Tunisia. Similarly, the belief that growing international trade and business ties boost wages is up 14 percentage points among Americans since 2014. Among Poles, it is up 14 points. Again, public opinion in Tunisia and Argentina has moved in the opposite direction. The share of Tunisians who say trade increases wages is down 22 percentage points and the share of Argentines who hold that view is down 13 points. More broadly, views on trade seem to reflect a public’s general economic mood. Globally, among respondents who think their economy is doing well, a median of 53% across 24 countries say trade creates jobs and 39% believe it increases wages. Among those publics who say their economy is doing poorly, just 43% believe trade generates jobs and 29% say it boosts wages. CORRECTION (December 2018): The data in this report and the accompanying topline have been corrected to reflect a revised weight for Australia in 2018. The changes due to this adjustment are very minor and do not materially change the analysis of the report.